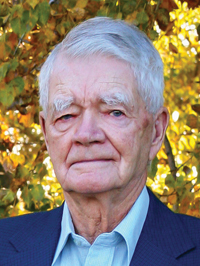 Russell Leo Wright, beloved husband of Mildred Wright, passed away peacefully, surrounded by his family in Medicine Hat on Tuesday, March 12, 2019 at the age of 102 years. Those wishing to pay their respects may do so, prior to the funeral service between 10:00 A.M. and 10:45 A.M. The Funeral Service will be held at Cook Southland Funeral Chapel, 901 – 13 Street SW, Medicine Hat on Monday, March 18, 2019 at 11:00 A.M. with Life Celebrant, Shelly Dawn Bassett officiating. Condolences may be forwarded by visiting our website at www.southlandfuneral.com. Russell is lovingly remembered by Mildred, his wife of seventy eight years and their thirteen children Russell (Alice) Wright of Hays, Gary Wright of Coaldale, Mable Leeson of Vauxhall, Doug (Lorette) Wright of Taber, Heather (Rodney) Skuban of Vauxhall, Gale (Robert) Connolly of Vulcan, Carmel Lewis of Milo, Richard Wright of Two Hills, Alan Wright of Medicine Hat, Pearl (Ian) Cully of Medicine Hat, Tim Wright of Taber, Barb (Lloyd) Tilleman of Lethbridge, Kelvin (Heather) Wright of Vauxhall and by numerous grandchildren, great grandchildren and great great grandchildren. He is also survived by his sister Dixie Alberts of Brooks. He will be fondly remembered by a large extended family. He was predeceased by his son Wayne Oliver Wright and a great grand daughter Manda Elizabeth May Emes. He has also been reunited with his parents, siblings and numerous other family members. Russell was born to Roy and Mable Wright on March 12, 1917 in Eckville. At a young age, he and his family of ten siblings moved to Picture Butte and grew up on the family farm and he attended Granite Falls School. He later met Mildred Cyr and they were married on October 19, 1940. They worked on the Cohen Ranch in the Cowley/Lundbreck area until Russell volunteered to serve in World War II. Upon returning from the war, Russell and Mildred continued farming and raised their fourteen children. A few hard years forced them off the farm and an opportunity with the Prairie Farm Rehabilitation Administration (PFRA) moved the Wright family to Vauxhall where he worked as a carpenter, ditch rider and assistant water master in the Hays and Enchant areas until his retirement. Retirement for Russell and Mildred was filled with many road trips, camping and enjoying museums and Alberta Heritage sights. At home, his greatest joy was spending time gardening in the backyard, tinkering with wood projects and time spent visiting with family and friends. In 2018, Russell and Mildred moved to Meadowlands Retirement Residence in Medicine Hat where he lived in comfort until his passing. It is with great pride that Russell will be honoured as being the last surviving Veteran of World War II in all of Alberta. If friends so desire, memorial tributes in Russell’s name may be made directly to the charity of one’s personal choice. I did not know your Dad but felt compelled to read his entire obituary for some reason. I found out the reason at the end of it. Reading it was a way to somehow honor him for being the last surviving Veteran of World War II in all of Alberta. That is an astonishing honor. You should all be very proud of him for all he did for our country. May his soul RIP.